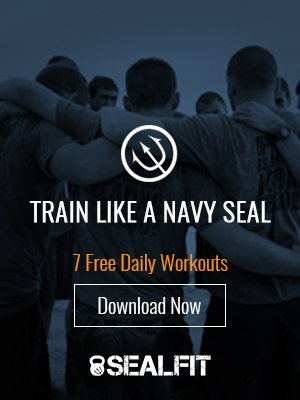 Imagine showing up at Basic Underwater Demolition SEAL training (BUD/s) on day one. Around you stand 175 swarthy SEAL candidates from all walks of life. Some are monster Adonis types who played linebacker for their college football team. Others are boxers and wrestlers. Others are underwater combat experts (code for water polo). Still others look like they just parked the tractor in the barn and hopped on a bus to Coronado. Every one of them is about ready to fight three fights, and the 40 or so who can win all three simultaneously while maintaining a great attitude and their health, will call themselves SEALs in 11 months. If you wonder whether you will be one of them… you won’t. First, let’s discuss the 3 fights. As my buddy Tony Blauer likes to point out – in a street fight you fight 3 battles. The first is inside you. That battle is overcoming your fears, steeling your resolve, maintaining an offensive mind set, developing skills, knowledge and personal power, and not succumbing to the habit of conveying special powers upon your enemy. The second fight is the actual engagement; the one most would consider the fight. This is often the easiest of the 3, and is certainly the shortest in terms of time invested. The third fight is between you and the system. Even if ambushed, a SEAL who beats the crud out of an assailant in California will have to answer for why a Navy SEAL with 25 years of martial arts experience could not control the use of force. Back to wet and cold on the BUD/s grinder. The second fight is clear to you. You must fight each and every one of these guys to earn the right to be standing tall on graduation day. That means that, out of 40 potential finishers, 39 will be your potential teammates, and the other 135 are your enemies. You are locked in a competitive battle with them to lock your position in the 40. You must do so by being crafty, every watchful, exploiting opportunity, being Machiavellian and Aristotelian at the same time. You must be intensely cooperative and forge a winning team, while also being intensely competitive – the stakes are the coveted trident, which some have literally died earning. You win the first fight first. The first fight is in your mind. You must win in the mind, before stepping foot onto the battleground. This is true for any situation in life. The question, then, becomes how. This is where the “big 4” come in. I can write volumes about mental toughness, but when it comes to tactics, the big 4 always bubble up to the top. You must master these 4 tactics to win in your mind before you step into the combat-like arenas of life. Whether you are a SEAL candidate or business professional, the big 4 are your toolkit to mental toughness and success. Let’s look at the first of these tactics. Control of the breath is not just useful for arousal control, leading to a lessening of the effect of the negative impact of stress, but also in the positive sense it is useful to change your state even if the stress facing you is “simply” performance anxiety. Elite athletes and Navy SEALs utilize breath control to prepare for missions and events. The act of psyching yourself up physically and mentally includes deep diaphragmatic breathing, forced exhalation breaths combined with powerful visualization and positive affirmations. Breathing is both a conscious and unconscious process. When unconscious we tend be do what is called “chest breathing.” This type of breathing is inefficient and labor intensive in that it requires more effort for the same amount of oxygen intake, lowering energy stores and increasing anxiety. Facing a stressful event, we should switch to a deep diaphragmatic breathing pattern. We can practice a deep diaphragmatic breathing pattern through a discipline we call Box Breathing. Box breathing is meant to be done in a quiet and controlled setting, not while you are in the fight. The pattern is simply a box, whereby you inhale to a count of 5, hold for a count of 5, exhale to the same 5 count and hold again for 5. You can start at 3 if this is difficult, or take it up a notch if easy. You should be uncomfortable on the exhale hold, and be forced to fill the entirely of your lung capacity on the inhale hold. When you are in “the fight” you will not want to hold your breath. So we turn to what we call a Relaxation breath instead. In this practice you will drop the hold and just inhale to a count of 5 starting from the diaphragm then filling up the middle of your chest then finally the top as if you are gulping in a final sip of air. Immediately you will begin to exhale in the opposite manner – starting at the top and ending with a puff to get the air out of the deep recesses of your lungs. Then you do it again and again. In the movie Sherlock Holmes Robert Downey Jr. uses a keenly developed sense of visualization to see a fight unfold in his mind moments before the actual fight begins. This appears to the movie-goer as if it was a special power that Sherlock had and us “normal” people don’t. Rubbish! As you have no doubt discovered by now, I believe the secret to happiness, success and riches lie in cultivating the full power of our minds. The mind is truly the most creative and destructive force ever introduced to the known world. It is routinely used to create amazing things, including the life you dream of, and also to destroy it all in a second. The secret weapon of the warrior is not the M-4, but visualization. This is the one tool that every Navy SEAL, Astronaut, Apache Scout, Olympian, Spartan, Samurai, Ninja and Top Executive throughout the ages have used to super-charge their results. See it, feel it, achieve it! If you are new to visualization it can seem simple and yet, daunting. How do you know if you are doing it right? Clearly you have embarked on flights of fantasy with wild imaginative meanderings. As a kid I was an avid daydreamer, often getting the chalk eraser beaned into my head from the teacher who was not impressed with my visualization skills. Imagination is a form of visualization that has many benefits. Not everyone has the ability to see in their mind’s eye. So if you love to daydream – you have an advantage! What if you see a warrior sitting quietly in the corner before a mission – do you think he is imagining what it would be like to have a successful mission? Well, not really. He is doing Focused Visualization. Focused Visualization is controlled, directed and empowered imagination grounded in a very specific purpose. Let’s take a look at two distinct forms of focused visualization that you will want to learn as you develop your mental powers. When we practice our self-defense program at SEALFIT we often will visualize the movement, and add very subtle body movements as if we were shadow boxing with our eyes closed. This reinforces the mind-body connection, and makes the internal visualization practice even more powerful and lasting. You have no doubt held a vision in your mind of how you see yourself. Sometimes this differs from how others view you – either positively or negatively. Regardless, what if you learn to hold a powerful vision of who you want to be at some time-certain future (Navy SEAL, Firefighter, Senator, Black Belt…). If you back the mental vision with massive action, do the work to root out negative blocks, and propel your vision with desire, belief and expectation, then surely you will become that person. When you first learn to shoot a pistol, your shot pattern on the target looks like swiss cheese, with most of the holes missing. As you practice the pattern gets tighter, with fewer and fewer thrown rounds. When you master the 25 yard static range, the shot pattern is tight, all rounds on target. Then you move to 50 yards and the progression starts all over until there are no thrown rounds at 50. Then you move to the pop-up range, then the moving range, then running and gunning. Same thing happens at each stage progression. You must start over at the basic level and develop the fine motor and focusing skills to get to the mastery level. At the mastery level, each shot hits its mark, every action is purposeful, powerful and eminently effective. There are no thrown rounds. The same process is relevant for hitting a target in your personal and professional life. You must master target practice for your goals. It is a trial and error process whereby you go through the same stages as learning to shoot. The more proficient you get, the fewer thrown rounds you have as you fire away at your goals. How do the masters do it? First, they know precisely why they are at the shooting range. The “why” is compelling and grounded to a profound purpose that goes beyond themselves. That way they never lose interest or momentum when the going gets tough. You don’t have to ask a Navy SEAL why he does what he does. It is displayed through his actions and confidence. Third, masters always crawl before they walk, and walk before they run. The magic is in mastering the basic tactics and techniques required to take the shot during the crawl stage, then developing standard operating procedures and layering skills on top of the basics during the walk stage, finally taking massive action powered by confident competence during the run phase. How do you ensure that you don’t throw any rounds as you progress toward your target, your goals? There is no such thing as perfect execution, only perfect practice. Know your “why” and check your goals to make sure they are worthy targets. Master the basics through practice, trial and error, and using the crawl – walk principle. Use visualization to practice and to see your rounds hitting the bulls-eye. Develop control of your breath, so that you mind is still and clear as you pull the trigger. In this way, you will become a master at accomplishing any target you shoot at, with no thrown rounds. Your goals should endure the challenges to their need, so that when the going gets tough and quitting sounds like an option, we can persevere easily because our major driving aim, or purpose in life, is in the line of fire. Practice these four skills daily and you will develop the mental toughness of an elite warrior.